This morning was a beautiful morning. I have been suffering from a headache the past few days, but as I awoke and looked out my front door there was so much beauty, which helped ease the pain of the headache. In the distance was a beautiful view of the fall colors on the trees and the mountains! The sun was shining on them just right. The Lord has allowed us the privilege of living in a place that has a view and where we can see pretty sun rises and sunsets. I am so thankful that He changes the seasons and for the beauty in each of them. Not only does he show us beauty in the seasons of nature, but no matter what season of life I am in, there is beauty in it as I let the Lord continue to mold and change me into His image. 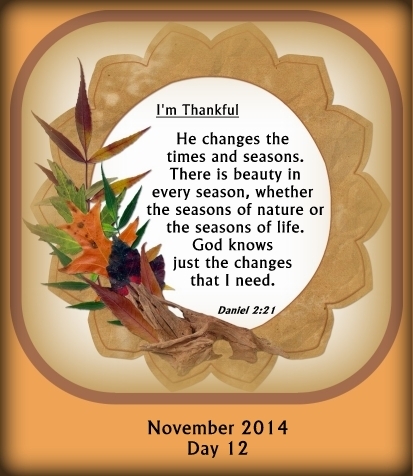 Do you know the creator, the one who changes the seasons? You can.